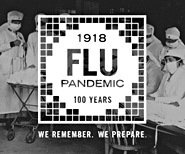 Information about the 2009 H1N1 pandemic is archived and available at https://www.cdc.gov/h1n1flu/. *Pediatric influenza hospitalization data for the 2007-2008 season from one site in the New Vaccine Surveillance Network (NVSN) contained errors. The data were reanalyzed and updated results were posted in the May 17, 2008, week 20 report. Other influenza surveillance systems are unaffected.